“We’re only a few days into 2019, but it appears markets have picked up exactly where they left off. There is growing uncertainty and volatility almost everywhere, and individual events are starting to become catalysts for sell-offs or rallies. Whether it’s Apple’s recent profit warning or Fed chair Jerome Powell saying that he is “listening closely”to the markets, investors are taking cues from current events to figure out where the herd is grazing. Get alerts whenever your accounts drop below pre-set watermarks, using AssetLock. When the market eventually shifts, it’s important to have a plan. You may even consider the possibility of re-allocating assets. This varies greatly by investment portfolio and should be evaluated on a case-by-case basis, with a qualified financial professional. It’s best to work with a fiduciary, because we value our client’s needs above our own and only recommend investments that benefit them. Contact Me To Evaluate Your Investments: (512) 638-9499. Jeff Desjardins. Visual Capitalist. Jan. 4 2019. “How Every Asset Class, Currency, and Sector Performed in 2018.” https://www.visualcapitalist.com/how-every-asset-class-currency-and-sector-performed-in-2018/. Accessed Jan. 9, 2019. James Chen. Investopedia. Jan. 2, 2019. “January Effect.” https://www.investopedia.com/terms/j/januaryeffect.asp. Accessed Jan. 9, 2019. Fred Imbert. CNBC. Dec. 31, 2018. 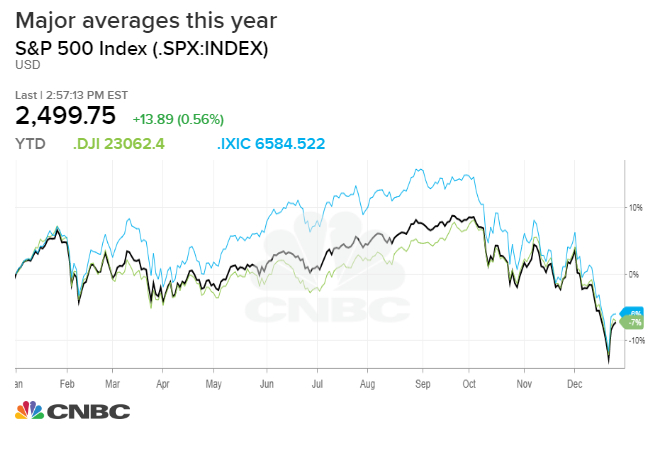 “US stocks post worst year in a decade as the S&P 500 falls more than 6% in 2018.” https://www.cnbc.com/2018/12/31/stock-market-wall-street-stocks-eye-us-china-trade-talks.html. Accessed Jan. 10, 2019.